Considering Paul Lambert’s ethos of turning Aston Villa into a possession-focused attacking team, it’s perhaps surprising to see Villa’s success on the counter-attack. The above table even shows Villa leading the Premiership in the percentage of goals stemming from the counter, which seems to suggest Lambert’s team very much mirrors the intentions of the Martin O’Neil managed Villa team of a few seasons ago. Villa’s success then was built on a sturdy defence and lighting-fast counter attacks, spear-headed by two wingers in the shape of Ashley Young and Stewart Downing, and the speed upfront of Gabriel Agbonlahor. It was a tactic that while worked wonders away from home, was limited when it came to breaking teams down at Villa Park. Many accused O’Neil of being one-dimensional and lacking in a ‘Plan B’. Aside from the emphatic demolition job of Sunderland at Villa Park, Villa have been largely more comfortable away from home this term too. Yet, Villa have a far from sturdy defence (they’ve conceded the most goals away of any team in the league) and Lambert hasn’t been employing out-and-out wingers. It’s a different dynamic entirely. As Villa’s possession game has built up during the season and the young players have grown in confidence and directness, rather than counter-attacks stemming from the prolonged absorbing of the opposition’s pressure, their counters are formed by breaking-up play and swift distribution to the forward three of Gabby, Benteke and Weimann, who inter-link to create chances. Having three forwards who all have pace and can play the channels with aplomb, has the advantage of having more clinical finishers on duty when it comes to taking chances. 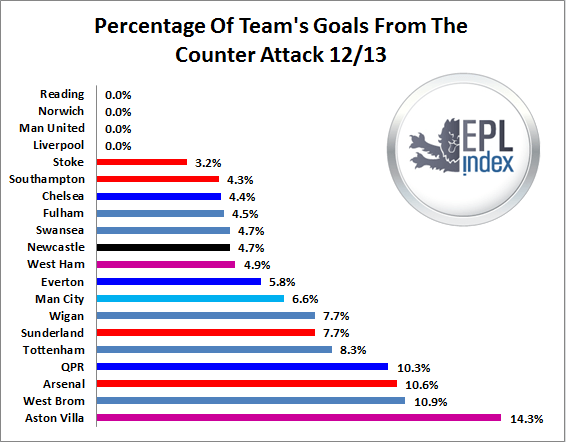 The table below shows that Villa have been the most clinical team in the league when it comes to taking their chances created on the counter. Good stats and very interesting reading. As you have highlighted we need to sort the defensive side of our game out – IMO we require an experienced centre back (although I am a little torn here as I think we need to be careful not to block the way forward for Baker and Clark or we could end up with another Cahill situation – I think the return of Davies might not be the worst option) and a strong left back to challenge/replace Bennett. The second challenge is to create more opportunities for the clinical front three. Great that we are clinical when we get a shot but we obviously need more shots. We really need a creative spark to come in as the third midfielder (our equivalent of Carzola/Mata/Silva). I thought SI was going to be this player but clearly not. I also hoped to see more of Carruthers after the little cameos last year but he is too young to rely on for a few years and would probably benefit from a season in the championship with, say, Wigan!! (see what I did there!) Haven’t seen the Crewe lad we keep getting linked to – Murphy – so not sure whether he could be this advanced midfielder although he appears to have scored goals which suggests he plays in this area. If we bought him and turned out to be as good or better than Westy then he could be a very good buy. Great little analysis here with some very surprising outcomes. I would not have thought we were the kings of the counter. However, absolute counter attack goals scored would have been interesting. I’m working backwards here and I reckon we have 6 counter attack goals and the Arse have six or seven. And WBA will be five or six. 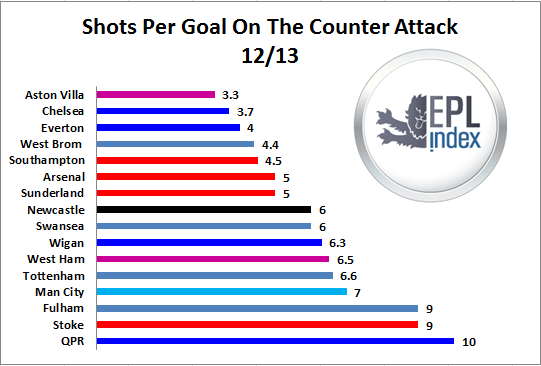 Not so impressive put like that BUT in conjunction with the shots per goal data we do look pretty good. It’s not surprising we counter effectively with the 3 strikers, none of which are slow and of course Gabby is lightening quick.